This version sees the V8 engine upgraded to version 6.0 (which has key performance implications) in addition to DNS, N-API and REPL changes. A new environment variable that lets you supply command line arguments to Node. This post explains why it’s useful. Interested in Continuous Deployment for Docker Apps to Kubernetes? Learn how to set up Kubernetes with Codeship Pro. 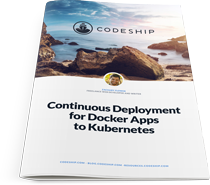 Get access to the free Codeship Kubernetes eBook and detailed setup guide. Changes, beginning in Node 8 and continuing to occur en route to Node 9, are coming to errors thrown by the Node.js runtime. Using N-API’s abstractions, you can create C/C++ addons without having a deep understanding of how V8 works. Following last week’s npm typosquatting story, Jordan Wright analyzes npm packages and how attackers use malicious packages to gain access/control over systems. A free course to get you started with developing and deploying Node apps and services on Azure. Node-RED is a powerful Node.js flow-based programming system. A conference that peeks into the web of tomorrow. Serverless, WebVR, Progressive Web Apps. 10% discount with code NODEWEEK. Learn how to scrape static websites with Node, request, and CheerioJS. Build some cool hardware projects powered by Node. With a demo of capturing screenshots of pages as you programmatically navigate a site. Some common authentication pitfalls, and how to avoid them. ..without a lot of boilerplate. Tutorial here.